Torso, brain (2 parts), cut calvarium, heart, lung (4 parts), stomach, diaphragm, liver, heart, trachea & esophagus & aorts, pancreas and spleen, intestine etc. - A female breast plate and interchangeable male and female . - Identification key card included with model. Being a client-centric organization, we are engaged in manufacturing Human Torso Unisex Models. Glass Agencies EROSE are manufacturer of Human Torso model. 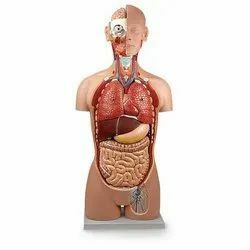 - This female torso features 15 parts, including torso, head (2 parts), brain, lung (2 parts), heart (2 parts), stomach, liver, kidney, pancreas and spleen, intestine, female (2 parts). Mounted on plastic base. Approx.600 mm. in height, dissectable into 6 parts.The brain is fixed in skull and can be seen after removing the skull cap. Lungs, liver, stomach and intestine are removable to show the internal structure. On base, with key card. 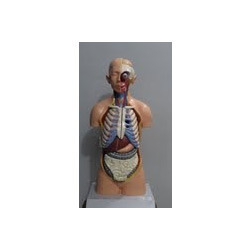 WE OFFER A RANGE OF HUMAN TORSO MODELS WITH MALE AND FEMALE PARTS INTO 18 AND 23 PARTS. we are selling on lowest price in india this price for one piece. We are highly acclaimed in this industry for providing an optimum quality range of Human Torso.